1. Freshly minced garlic 1 bulb, 10oz sliced mushrooms, red onions, spinach, salt pepper and some bbq rub, into skillet for just about 5 mins to meld the flavors, added a little white wine and then a package of Corn Bread stuffing mix, mixed and set aside. 2. Granny Smith apples, Cranberries(ocean spray sweetened cranberries in bag) about 1 handful, red onion, Orange rind and juice and half orange added, fresh ground pepper and salt and added to skillet for 5mins approx and a little cornbread stuffing mix that was left over. 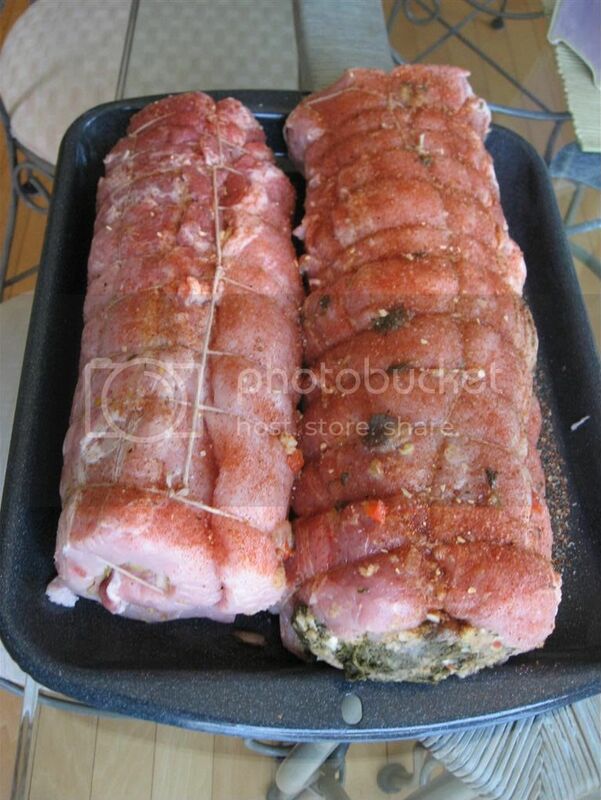 After roll slicing the 2 pork loins I salt and peppered the inside and added stuffing, rolled the stuffing, and then used 100% cotton butcher twine to tie and secure, salt pepper the outside on each. I added just a dusting of bbq spice on the Mushroom Garlic. Used the middle grate for the Pork Loins and the empty, foiled water pan, it was around 320° when I added the loins. I had Apricot wood chunks and a chunk of Hickory for this cook. Into the cook about 1.5 hours I added my first glaze to the Apple Cran loin. The glaze was heated in a saucepan till bubbling and consisted of Blackberry preserves and lemon juice. I applied the second time about 15mins before removing the loins. The Garlic Mushroom was not touched once it was on the WSM, but they both received drippings from the ABT’s above, heavenly bacon drippings! Pork Loin had about a 2h45min cook to 160° internal temp. The WSM went from 320­° – 280° throughout the cook.